By and large, that is. It can be reduced into a simple formula. It's grounded on the basics of human behaviour, nothing really mind-blowing. And since it's loosely based on the theory of the late American psychologist Abraham Maslow, I can't take all the credit. We shall call it the Raphael-Maslow Equation. According to Professor Maslow, human needs can be broken down into five distinct classes, of which we strive to attain them in hierarchical order. It's a classical theory widely taught in business school, and not only amongst psychology students, to rationalise what motivates us human. Bored already? Here, have a lollipop! What women want out of a man can be broadly broken down along the same basic building blocks, albeit with slight deviations. 1. Biological - The first impression that women looks out in a man. High cheekbones, large eyes, height, broad shoulders, and all that jazz. Qualities that excite hormones, and exude hotness. Not sure why women's primal instincts work that way. Maybe they're proven signs of a man's prowess to hunt down animals in the wild, or work magic on the bed - you know, like nature's way of making sure the best genes are carried forward to future generations. Given the chance, most women - regardless of age or race - tend to gravitate towards Caucasian men (due to the superior genes theory, one Bosnian informs the Malaysian court). Blame it on genetics, social conditioning or the media - it's a fact that women are biased towards certain physical characteristics. 2. Security - Every woman yearns the protection of a man. Again, it's one of those primal instincts. By today's standards, security means a high-salaried job or profitable business, good family background and solid education. Women expect to be spoilt - er, I mean, supplied - with luxurious homes, bags, jewelry, and so on. Fidelity is a grey area - some women are willing to turn a blind eye to their husbands having the occasional fling, so long as they don't stray too far away and too often (after all, bigamy was only outlawed over the last century in the West, and still allowed in certain Eastern cultures). In big cities, women are commonly mocked for judging men based on the 5Cs - cash, car, credit card, condominium and club membership. And why not? It's perfectly reasonable for a woman to want the best for her family, children and herself. 3. Social - The original 5Cs? Character, charm, chivalry, chemistry, and... er, confidence? Like how women say they like someone who "makes me smile and laugh" (then again, a diamond ring can put a smile on a woman's face just as easily as a well-timed joke), or someone who they would like to "grow old with". Add intelligence and artistry to the list, too. Some women are drawn towards the smooth-talking gentleman, some to the quiet, brooding painter. It's that indescribable feeling. Some just fall for the "guy next door". Simply put, women also look for qualities beyond the physical and material world. So for guys who ain't got the looks and money - don't give up hope just yet. 4. Esteem - Modern women are no longer contented being confined to the kitchen and nursery. They are driven to have careers and social lives of their own. Marriage doesn't mean sacrificing one's independence. A man's home is no longer his castle - women demand an equal, if not more, control over the TV remote control and delegation of house chores. Women are increasingly conscious of their self-worth. They resent being relegated to the role of trophy wife and full-time home-maker. They want men to respect them as equals. So guys - start deflating your ego and mind your language (no, "female emancipation" does not mean "that time of the month"). 5. Self-actualisation - Some women want to be more than a woman. A superwoman. Like how Bruce Wayne wants to be more of a man. Turn back the pages of history books, and you will find that the world's most influential people are predominantly male - Moses, Caesar, Shakespeare, Einstein Steve Jobs, etc. Nevertheless, there's a fair amount of celebrated heroine - Joan of Arc, Mother Theresa, Margaret Thatcher and Aung San Suu Kyi. Female empowerment is on the rise, as are the numbers of female leaders in politics and business. And for the men who are partnered to such ambitious women, they have to accept playing a supporting role, for a change. Non-Caucasian men don't get enough universal lovin' from Caucasian women - unless you're Rain. Not all individuals function the same way. 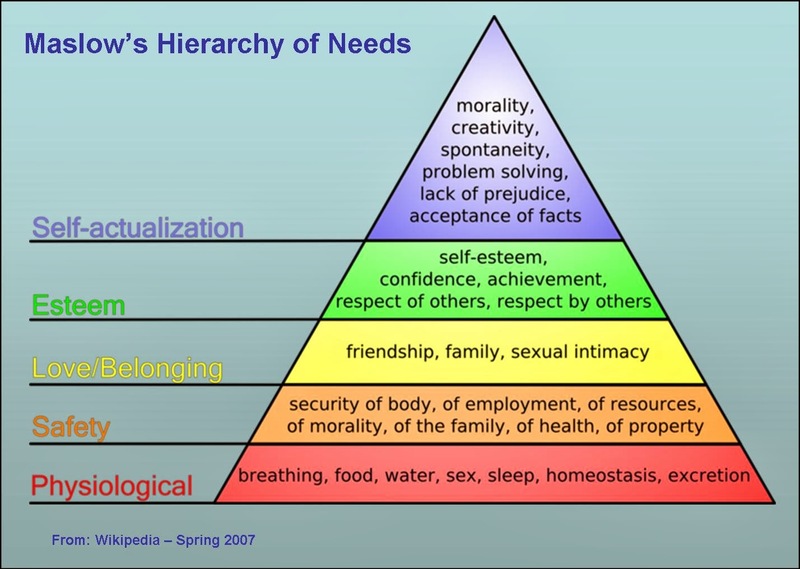 Maslow himself recognised that the hierarchy is not an arbitrary leveling-up process - that is, some individuals may place more importance on the upper needs over the bottom needs. Political activists go on hunger strikes to fight for social reform, whilst artists will forgo a stable education and job to hone their craft. Likewise, woman have different preferences and priorities when it comes to choosing their men. Some are a sucker for bad boys, some admire powerful men. And that's why the Raphael-Maslow Equation works more like a mathematical index, rather than a hierarchical pyramid. Its purpose is to quantify the requirements that a specific woman looks for out for in men, quantify a specific man's capacity to satisfy those requirements, and finally to measure their compatibility. 1. On a ratio of 10, value the woman's preference for each of the 5 basic needs. - The more important the need, the higher the value (a need can be valued as zero, too). - Arrange the values in a line (bottom to top -> left to right). - The total values added together must equal to 10 - not more, not less. - Example: A woman who prioritises the bottom needs may have a ratio looking like 4:4:2:0:0. 2. On a scale of 1 to 10, rate a man's capacity to fulfill each of the 5 basic needs. - The higher the man's capacity to fulfill a need, the higher the rating. - Arrange the ranks in a line (bottom to top -> left to right). - Example: A handsome, rich but obnoxious man may have ratings looking like 8-8-5-3-1. 3. On a percentage of 100, measure their compatibility. - For each respective need, multiply the woman's ration value with the man's scalar rating. - The higher percentile, the higher compatibility. It's not a complex formula at all. The basic concept is that each woman has a bundle of needs with varying degrees of values, and the level of her attraction to a man depends on the man's capacity to fulfill her high value needs. The tricky part is quantifying the values and ratings. Needless to say, it is an exercise requiring a fair amount of empathy and honesty. In short, Maslow's theory - supplemented by my variation - is a qualitative tool to guide a man in evaluating his chances of winning a woman's heart. Mastering the Raphael-Maslow Equation, a quantitative tool, is not a must, though a helpful bonus. 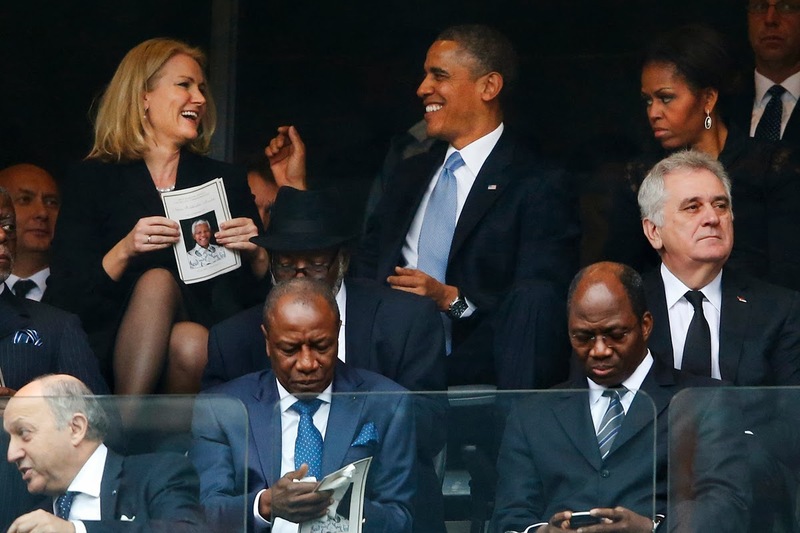 The woman on the left - who reduced President Obama to a giggling college freshman, with his First Lady looking on with the "you're sleeping on the couch tonight" death-stare - is Danish Prime Minister Helle Thorning-Schmidt, and strikes me as a rare diamond i.e. Type 1:2:4:2:1. Whilst every woman is different, there are certain general truths, tips and trends that every man should keep in mind. The list is by no means exhaustive, yet good enough to offer glimpses into the depths beneath the surface of my theory. 1. Woman's Needs Changes Through Time - The girl you first met from college when you were 18 might not be the same woman you reacquaint with 10 years later. As people age, their life priorities change, thanks to experience and maturity. She may used to be a Type 5:2:3:0:0, a screaming Twilight fangirl at 18. But after a few roller-coaster, whirlwind, summer romances, she's now transformed into a Type 2:5:2:1:0 realist of whom "LV" is not just a Roman numerical. Who knows? Your childhood crush who rejected you once, a long time ago, may one day return to reignite the old, flickering flames of passion. 2. The Rise of Miss Independent - Traditionally, women tend to be bottom-heavy - no, this is not reference to their physical shape, but to where their priorities lies in the Maslow pyramid. For example, in olden times, many parents arranged marriages for their children - this hardly gives any time and space for the unwitting spouses to familiarise with each other on a personal intimate level. Nowadays, their priorities have changed. As women grow more financially independent, self-driven and wary of domineering alpha males, they are becoming more mid-heavy and top-heavy. That is, don't expect that baring your muscles and flashing your credit cards are enough to impress women. They want a balanced relationship, too. Like taking turns being on top, and calling the shots. 3. Focus On Your Strengths, Focus On Your Type - From a statistical and strategical perspective, any man would be inclined to boost up his ratings across the board. Start taking protein shakes, getting a loan to buy a fancy car, and read up on self-help books on dating women. The goal is to be the man for all seasons, the man with a perfect 10-10-10-10-10 rating. But that's foolish thinking. Firstly, you're changing yourself simply to appease women (and vice versa, women shouldn't fall into the trap of wearing painful six-inch high heels simply to appease men). Secondly, if you're genuine about finding the right woman, she will accept you for who you are with all your natural flaws (which excludes flaws within one's control like laziness and selfishness, obviously). And thirdly, to win a woman's heart, it's not necessary be Mr. Perfect in all aspects, but simply to hit the right spots (for example, a Type 1:2:4:3:0 female and Type 6-6-10-9-6 male would already have a whooping high 85% compatibility!). Not even James Bond has perfect 10 ratings - any woman he beds with either dies horribly or gets dumped unceremoniously, so he's closer to a Type 10-0-10-0-0. The theory and equation that I have discovered - if one could even call it a "discovery" - is hardly a worthy contender to a Nobel Prize for Physiology. Nevertheless, it's a helpful guide, or at least a reminder, on the key types of qualities that a woman looks out in a man. As a woman, the theory also makes a good read - it will help you reflect on your priorities in life. If something is lacking, the solution is not necessarily turning to a man to fill those gaps, when you can easily fill them yourself or with the help of family and friends. Think carefully about your needs, and whether only a man can fulfill those needs. Eventually, you will find out what you really, really, want out of your man. In the rom-com "She's Out Of My League", we are told that - since Molly is a perfect 10, Kirk is only a measly 5, and that the rule states "you can't jump more than two" - Molly is way out of Kirk's league. The rule is based on a formula even simpler than mine, yet shares the fundamental idea that relationships can be rationalised and quantified. Or maybe relationships aren't meant to be rationalised and quantified? Like how Woody Allen in "Annie Hall" describes relationships as a man visiting a psychiatrist to complain that his brother thinks he's a chicken, and when the psychiatrist ask the man why he doesn't turn his brother in, the man replies "I would, but I need the eggs". Yes, we keep going through cycles of relationships, because let's face it, most of us need the eggs. Then again, we should at least know what's inside the eggs, before taking them home. A few days after I published this article, an article entitled "All-or-Nothing Marriage" by psychologist Professor Eli. J Finkel appeared in the New York Times. As he examined the historical evolution of the marriage model (institutional, companionate and self-expressive), Professor Finkel noted how closely it "echoed" Maslow's theory. So I'm clearly not alone - and probably not even the first person - to draw parallels between social relationships and Maslow's theory.